The Ultimate Question: How Much Money Should Your Kickstarter Video Raise? As of now, the Kickstarter success rate is only 35%. Most of those campaigns will raise less than $10,000! 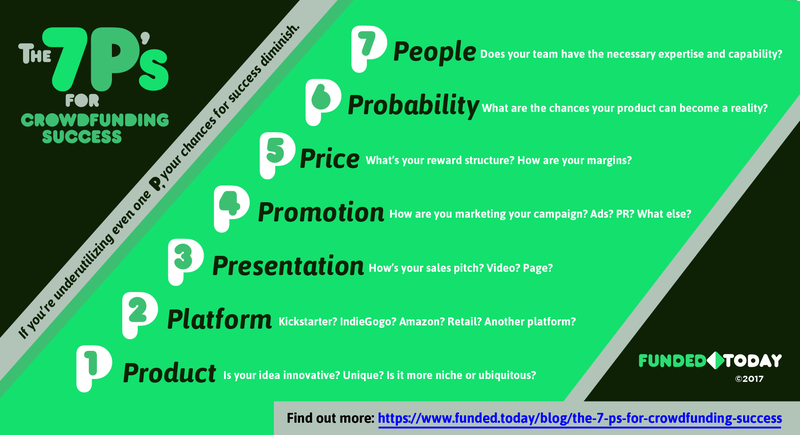 A failed campaign generally means that you are missing one of the 7 P’s of Crowdfunding Success. While any one of these P’s can tip the scale and wreck a campaign, we’re going to focus on two main P’s that will affect how much your Kickstarter video can raise for your campaign. They are: 1-your product and 2-your presentation. If you want your Kickstarter video to raise you tons of money, then it’s star (your product) needs to be something unique and ubiquitous. You may now be wondering: What does ubiquitous mean? Well, the bigger the percentage of the world’s population that would love to own a certain product, the more ubiquitous that product is. Ubiquitous means that a product can be found everywhere. Or if you are a visionary, it will SOON be found everywhere! While every campaign creator should believe in their product, every creator should also be open to learning from their potential backers' perception of that product. Sometimes you may think your product is the best thing ever and the potential backers disagree. Sadly, even when your friends and relatives tell you they think your idea or product is superb, that doesn’t mean the Kickstarter population will agree. Why is this product different/special/unique? Is there something about your product, some benefit, that makes it wholly special? Would you buy this product? Will your family and friends actually give you cash for it? Is your product “techy” or cool? Will a lot of people need or want this product and/or its benefits? If you can answer these questions positively and confidently, you may be on the right track. Kickstarter is the perfect place to test your hypothesis and validate whether your product is the next big thing or not. Now it’s time to look at your video and page design. No matter how great your product is, without the right presentation in place, your campaign may suffer. Better Presentation = Better Conversion. Besides your product, your video is the number 1 factor that can make or break your campaign. We have seen so many campaigns that struggle to reach their funding goals because the presentation doesn’t effectively sell the product. Both the video and the page design are key to the success of the campaign. It’s true, you can do it yourself or hire a company to do your video for a few thousand dollars. Still, you need to consider; do you want to only raise $10,000 or are you reaching for $100,000-$1,000,000?! If you are aiming higher, the quality of video you should be looking for will cost you around 10K-$15K. Some videos that you see on Kickstarter cost $50,000+, and that is fantastic if you have that kind of money to spend on your video. More power to you! When Funded Today handles your presentation AND your marketing, It is not necessary to pay an arm and a leg for your video. Take a look at the top funded campaigns on Kickstarter. What do they all have in common? A compelling, attractive, well-made video. They didn’t cut corners on their presentation, and if you want to raise millions of dollars on Kickstarter, neither should you. Is the video script persuasive? Does the video draw viewers in within the first 10 seconds? Is the video length short enough to keep viewers attention, yet long enough to adequately sell your product? Does the lighting highlight your product in an attractive way? Did you answer yes to all these questions? If you are the slightest bit unsure, I would recommend at least consulting with crowdfunding video production experts. If you haven’t started your video yet, GREAT! We would love to help you create your Kickstarter video and/or page design. Now let’s look at the numbers to get a better idea how much your Kickstarter video should raise. Kickstarter, Indiegogo, and other similar platforms are all great places to validate your product or idea. Some go into crowdfunding with the expectation that they will become millionaires when they come out on the other side. The truth is that very few campaigns reach that million dollar mark, and to get there you really need to invest in your presentation and marketing. 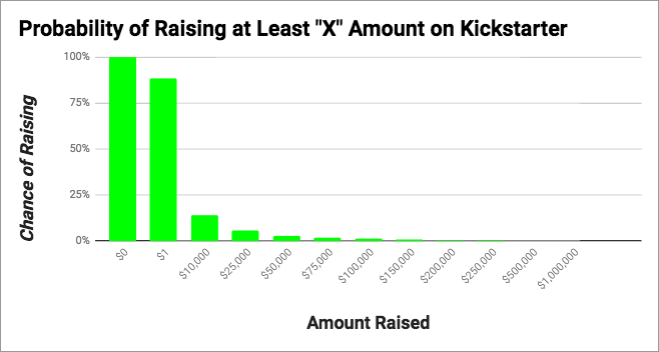 If you raise over $50,000, you are in the top 3% of all Kickstarter campaigns. If you raise over $100,000, you are in the top 1% of all Kickstarter campaigns. If you raise over $250,000, you are in the top 0.4% of all Kickstarter campaigns. Even though the numbers don’t look very promising, crowdfunding is still a great route to go. Outside of Kickstarter, 8 out of 10 businesses fail, so if your campaign doesn’t fund, this is not necessarily a bad thing. Would you rather invest thousands and possibly millions for years and years into a business, just to find out there isn’t enough interest, or would you rather find out in a month if your product or idea is good enough to create a business? Your Kickstarter video can only raise what you give it the power to raise. Don’t fall prey to thinking your product is so awesome that it will sell itself! If more campaign creators would invest in quality presentation and marketing for their campaign, I bet the success rate would go up. Funded Today has helped 28 campaigns (and counting) raise over a million dollars and hundreds of other campaigns to surpass their goal. We have raised over $148,900,000 in total, which is more than any other company out there. It’s safe to say we know what we are doing. When you do both your Kickstarter video and marketing in-house at Funded Today, your message will be more consistent and therefore more powerful. If you want to set your campaign up for success to beat the odds, fill out this online form to get in touch with one of our client specialists today!